Are you sweating yet? The D.C. area is experiencing a true taste of summer Wednesday, with record-breaking heat recorded at Dulles International Airport, and in the high 80s to low 90s elsewhere. 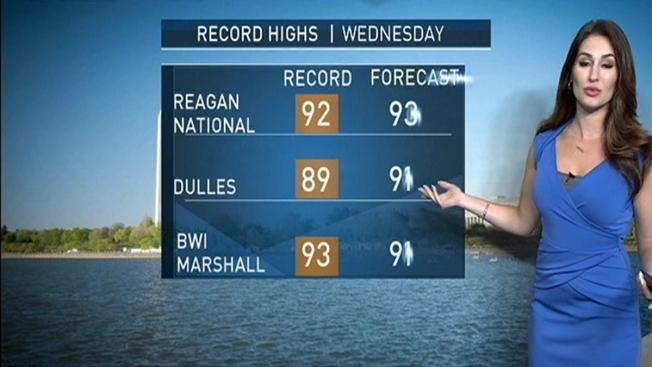 Dulles hit 91 degrees early Wednesday afternoon, beating an old record by 3 degrees. It's possible that another record could be broken at Baltimore-Washington International Airport, which reached 92 degrees by 2 p.m., just a single degree below the record. While temps at Reagan National Airport have reached 88 degrees, Storm Team4 isn't expecting any records to be shattered there; the current record is 92. Of course, with that heat comes the chance for a storm. There is a very slight chance for an isolated thunderstorm along the Interstate 81 corridor Wednesday and Thursday afternoon, Storm Team4 said. And the heat will continue. Temperatures are also expected to soar into the 90s Thursday, Storm Team4 meteorologist Chuck Bell said. The next big change in the weather arrives Friday, as a cold front crosses the area and brings a line of thunderstorms across the region. Some of Friday's storms could be strong to severe since there will be plenty of heat and humidity to work with, Bell said. The weekend will be much, much cooler, with temperatures in the low to mid 70s.